Chole Bhature is a very popular North Indian delicacy. You would find it in most of the North Indian restaurant menus. It is a favourite combination at home as well and we relish Chole Bhature with lemon pickle and sliced onions. If you haven’t tried this incredible dish yet, go ahead and give it a try. 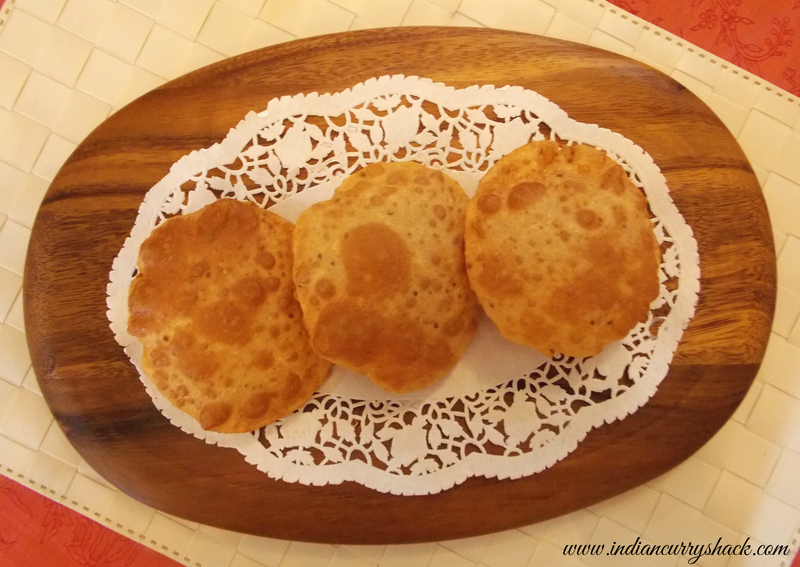 I had uploaded the recipe for Chole (chickpeas curry) earlier (click on Chole to be directed to its recipe) and today bringing to you all the recipe for super delicious Bhature (Indian deep-fried and puffed bread made with plain/refined flour). To make the dough – Sift Plain/Refined Flour (Maida), baking powder and baking soda in a deep bowl. Add sugar and salt and mix with the dough. Now add natural yogurt/curd little by little and knead into a semi-soft dough. Add a little water only if required (else, skip adding water). Let the dough rest covered with a thin cloth or a lid for about two hours. Grease your hands with some cooking oil and divide the dough into 8 equal parts and give each part a round (ball-like) shape. Take one dough ball, flatten it by pressing it between your palms and coat it with some cooking oil (oil coating will prevent it from sticking to rolling pin or rolling board or kitchen platform). Roll each ball to a small roti using the rolling pin. You can give the bhature an oval shape too. 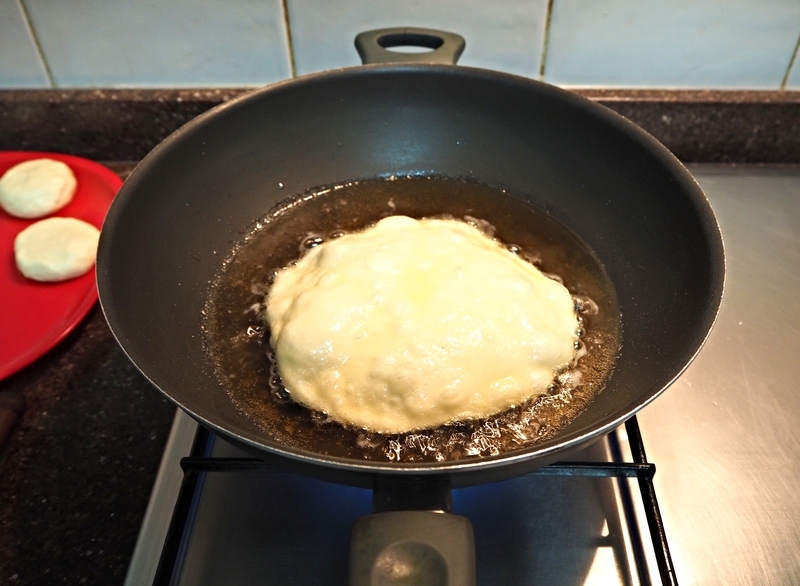 While you are rolling the bhature, start heating a kadhai (pan) with sufficient cooking oil for deep-frying. When the oil is hot enough (it will start bubbling from the sides) then carefully put the bhature in it one at a time (depending upon the size of your pan you can put 1 or 2 bhature and fry them simultaneously from both sides). Once puffed or slightly golden from both the sides then you can transfer the bhature to a plate with tissue paper which will soak the excess oil. Keep the flame on high to medium while frying. Transfer the bhature to a plate and relish with delicious chole (chickpeas curry), salad and lemon pickle. Relish with your family and friends!